The camping trip to Quietwoods South Campground in Brussels, WI, was bunches of fun! It was SO hard having to pack up when it was time to leave! This year was a little different than normal as we only had two families that camped. Some of the ‘regulars’ blamed it on the fact that the temps were going to be pushing 100 degrees during the weekend. I can’t be one to judge, though because, we rented an air-conditioned cabin for the trip. (Not my idea, hubby wouldn’t go if we tent camped.) 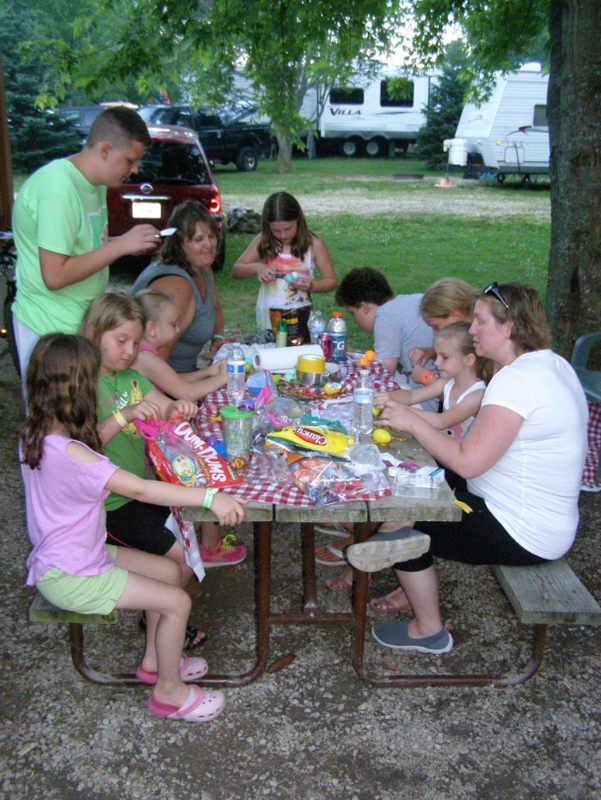 Although, we only had two camping families, three other families joined us for the GBAMOM activities that were planned. Friday night we enjoyed a hearty Sloppy Joe's and potluck supper together. On Saturday, the planned activities included a Scavenger Hunt (with prizes), Watercolor Painting, Nature Names, Frisbee Tic-Tac-Toe, Glowing Firefly Making, and Leaf Jewelry Making. Due to the Storm Watch for the evening, we had the S’mores Bar in the afternoon instead of the evening. YUM!!!!! Supper on Saturday was an Aloha Potluck with Pork Sandwiches supplied by the campground. Thankfully, the weather cooperated so that supper could be followed by more S’mores Bar indulgence! Following supper, the kids participated in the annual Piñata Activity. All the kids got a turn to hit the Tiki piñata, in order, from youngest to oldest! This one started breaking open too soon so we had to tape it up between some of the hits. We’ve got some powerhouse kids in the group!! Sunday morning, we took our time packing up. We decided to not head home right away and enjoyed the pool and water slide until late in the afternoon. We had great weather each day (except for a short rain early Saturday morning) and had lots of fun. It's always more relaxing to camp with the GBAMOM group because we always do such a good job helping each other out! Think about joining us next year! We would love to have a big group of new campers to have a fun family weekend with!! PS - GBAMOM Camping is for the Dads, too!